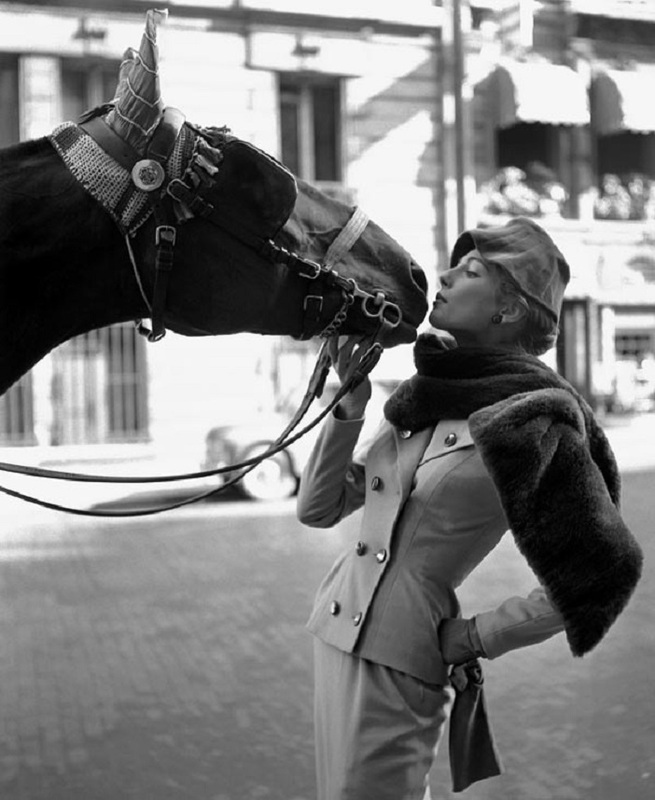 Wrigley Gum heiress and horse rescuer Helen Rosburg coined the phrase, “when Wrigley women get depressed we go right to the barn.” A generation prior, Dambier captured top model Fiona Campbell nuzzling with a hackney horse in a Marc Bohan outfit dans les rues du Paris forElle. What the horse whispered to Fiona in this 1953 shoot we will never know. But the image was enough to grab the attention of billionaire Swiss art mogul Hans Heinrich “Heini” Thyssen, scion of the German Krupp steel and armaments fortune, to make the Scottish (some sources say New Zealand born) lovely his third wife. In his book The Germans, former OSS man and journalist for the New York Herald-Tribune George Bailey, who was on the scene with Hemingway during the liberation of Paris, noted the horsey eccentricities of Heini’s German father Heinrich, who had a pipe connected from his office down to his barn so he could partake of the earthy smells at will. Other Dambier girls were available to Heini and his inherited bankroll in post-war Paris, but the likes of Bardot, Capucine and other ingenues did not open his nose like the horsey Campbell girl. The marriage lasted nearly a decade, until 1964, when Thyssen hooked up with Denise Shorto, a Brazilian beauty from a prominent banking family. Fiona’s sad slide followed. She became involved with the son of Aristotle Onassis, although sixteen years his senior, a relationship his father disapproved of. The only Onassis male heir died in a plane crash at age 25 while his father was courting the widow of an American president. Billionaires still collect beauty as if it were a Picasso or a Rodin. Like good whisky, Scottish women age well over time, as with Fiona, whose obituary has yet to be published, memories of taste slake across the palate. Like Garbo and Norwegian ice princess Sonia Henie, who had a steamy relationship with boxer Joe Louis when such things were taboo, the beauty that was captured through the lens of Damabier fades into darkness.